I had a small dinner party over the weekend; a dinner party with a twist. As well as some mums from my sons' school, my friend Kim Worgan came over. She was the 'guest of honour' as she had agreed to share with us her mediumship skills as an after-dinner treat. After a lovely dinner (though I say so myself) of vegetable chilli - roast the veg first - and a hot chocolate fudge cake for dessert, we were ready to proceed. Kim rose from the table (not literally, she doesn't do levitation as far as I'm aware) and took command of the gathering. She explained what mediumship was about, how she could act as a conduit between those in this world and our loved ones who had passed and then she brought through a lady who had gone prematurely grey and loved cruises - my mother, to a tee. That's a photo of my mum to your left. Kim knew it was my mother as she also brings with her a pain in Kim's abdomen, a legacy of my mum's terminal pancreatic cancer. She gave through some accurate and comforting information through Kim and then reluctantly moved to the side to let someone else through. Everyone at the table got a message of some sort, although my friend Sam's was more a menagerie of animals she had known. Deborah, another guest later checked with her mother some of the details about a great aunt, which she hadn't known about- a purple tree in the garden. She discovered her great aunt had a lilac tree. The format of a demonstration worked really well and everyone had a really fun evening. 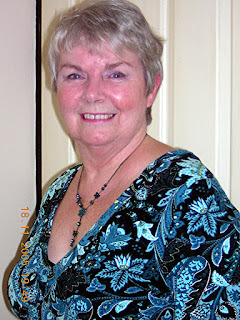 Kim works in the North Hampshire, Berkshire and Surrey areas, so if you are interested in having such an evening yourself, especially as Christmas approaches (and we mums need all the fun we can get) please contact her via her website http://www.kimworganpsychicmedium.co.uk/ or via email: kim_psychic@hotmail.com. The costs for the evening are very reasonable considering you get a really unusual dinner party that will be the talk of your guests for a long time to come. It weren't like this in my day..